This site was created with the generous assistance of the Ministry of Agriculture, Forestry and Fisheries. We have the special holiday from 29 Aug., 2017 to 01 Sep., 2017. We are sorry, But our paypal site is non-usable, now. We will recovery soon. We apologize for the inconvenience. One year have passed since the Great East Japan Earthquake. We are now hoping for their early recovery from the Great East Japan Earthquake. And thank you for your order on our donate product. We got 12 order about them in one year. We will make a donation part of the profits from sales for the disaster areas through Japanese Red Cross Society. We display and sell our green tea or Matcha cookie in Salon de Agriculture http://en.salon-agriculture.com/ in Paris from 25 Feb., to 4 Mar., 2012. The Shizuoka Prefectural Government conducted tests for radioactivity on tea produced in Shizuoka prefecture. Research on first harvest fresh tea leaves and brewed tea tests revealed that radioactivity values fell below the provisional regulation values enforced by the Nuclear Safety Commission of Japan and the Food Sanitation Act of Japan. With regard to the first harvest of processed tea produced in Shizuoka prefecture, tests conducted on June 7 and 9 in 19 locations determined that radioactivity levels did not exceed the regulatory values. (by Shizuoka Prefecture web site). Actually, there are not many, but we sell some Shizuoka green tea (Kawane-cha). Other green tea are almost Kyoto or Kyushuu area's. And then, of course our Shizuoka's wholesaler checked the test about them. And we got a message they are no problem. So please do not worry about that. I'm sorry for the inconvenience I've caused you. We express their heartfelt sympathy to the victims. On March 11 at 2:46pm JST a massive 9.0-magnitude earthquake occurred near the northeastern coast of Japan, creating extremely destructive tsunami waves which hit Japan just minutes after the earthquake, and triggering evacuations and warnings across the Pacific Ocean. The earthquake and tsunami have caused extensive and severe damage in Northeastern Japan, leaving over thousands of people confirmed dead, injured or missing, and millions more affected by lack of electricity, water and transportation. We live in Kobe. So we experienced the Great Hanshin-Awaji Earthquake in Kobe. We will make a donation part of the profits from sales for the disaster areas through Japanese Red Cross Society. The target securitie(Matcha Grade No.5) is free shipping. And we are going to donate a part of the profits from sales to needy people. So if you are OK, please order this with your another order products. We will inform you about the charity on this web site. Valentine's Day!! How about matcha chocolate? For a limited time(From 20 Oct., 2010 to 10 Jan., 2011), we are offering free shipping for all orders over 10000JPY by Paypal. Why don't you try to eat our Matcha soft cream? We will open our new store in north area of Kobe on Mar. 27, 2010!! Happy Valentine's Day!! How about our Matcha chocolate? We will put our Matcha cookie and KOBE Matcha Green Tea at the fair of Jiuguang Department Store of Shanghai（久光百貨店）, China on Feb. 5 ～ Feb. 7, 2010. A Happy New Year!! We are look forward to continuing progress in this New Year. Next year, it is VISIT JAPAN Year 2010 in Japan. 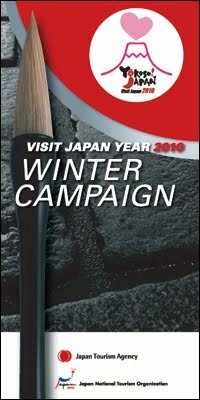 And Japan National Tourist Organization embark on a campaign. 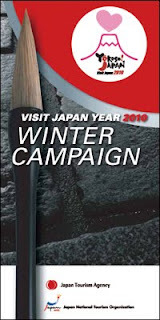 Of course, we would like to participate this VISIT JAPAN CAMPAIGN. Now, our store is participating in the WINTER CAMPAIGN. 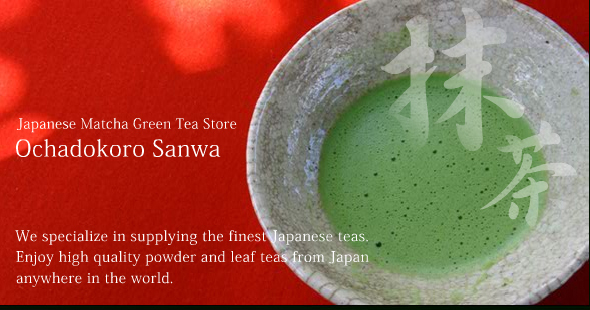 When you visit to KINKI (Hyogo) in Japan, please come to our Japanese green tea store. And before you visit to Japan, please download the coupon. We are very much looking forward to seeing you!! Now, our matcha cookies are sold at B1 floor of SHIN KONG MITSUKOSHI ( 12 Nov. - 29 Nov., 2009). Taiwanese, please don't miss it on this chance!! Matcha cookie is really tasty and the package is really good!! Thank you for waiting. Matcha chocolate will be on sale from today!! Sep. 21 is Respect for the Aged Day in Japan.敬老の日(Keiro no hi) Green tea will be excellent gifts for that day. We are offering for a limited time only at the following shop. 1. Please put in the matcha green tea(3g) in the stainless bottle. And pour in water or hot water at body temperature(200ml). 2. Please fasten the cap on the bottle tightly. 3. Please shake and shake!! 4. Please put some ice in the bottle until full. There is nothing better than drinking cold matcha on a hot day. Please check how to make it!! Our Matcha cookie elected as 「40 Export Promising Processed Foods Recognized by the World」of Ministry of Agriculture, Forestry and Fisheries of Japan"WASHOKU-Try Japan's Good Food"
Father's Day is on June 21 in Japan. How about green tea gift set? We will go to Tokyo! !The event of NIPPON TELEVISION NETWORK CORPORATION. We will bring our Matcha cookie. Arrival of the first tea of the season!! Arrival of New tea pots!! Our Matcha cookie got the Great Britain Prize in the Visit Japan Campaign 2009 food contest. The Matcha cookie will be available at Japan's two major airports -Narita, Kansai international - from May 2009. Valentine’s Day Special! You can select your wrapping paper. New products! Oofuku-cha and Onenga-cha. They are the special green tea leaf for a new year! Receive a free Japanese tea pot with every order over 10000JPY. If you want rich green tea with full flavor, try Matcha or Sencha Fukamushi. If you want smooth and mellow sweet grassy green tea, try Gyokuro or Matcha. If you want brisk, refreshing tea with a yellow green color, try Sencha. If you want tea to serve with sushi, try Sencha or Konacha. If you like black tea, try Hoji-cha. If you like coffee or a roasted grain flavor, try Genmaicha or Genmaicha with Matcha. If you want tea low in caffeine, try Genmaicha, Hoji-cha. If you want to enjoy genuine Japanese tea without teapot at your office, or on a trip, and so on, try powdered tea. If you want healthy tea - ALL of our green teas are very healthy and have a wide variety of vitamins and other nutrients.